Background: VSL#3 has been extensively investigated and is currently recommended for the prevention and treatment of chronic pouchitis and ulcerative colitis. Nonetheless, in vitro and in vivo studies have recently shown variability in the VSL#3 efficacy often attributed to the manufacturing process. Objective: The aim was to comparatively study the in vitro effects of two VSL#3 preparations produced in different sites (named US- and Italy-made VSL#3) on CaCo-2 epithelial barrier model in terms of trans-epithelial electrical resistance (TEER), dextran flux and expression of Tight Junctions (TJ) proteins i.e. zonulin-1 (ZO-1) and occludin, in the absence or presence of a heat stress-related damage of monolayer. Methods: TEER was evaluated on CaCo-2 differentiated monolayers. Epithelial permeability of polarized monolayers was assessed by measuring the FITC-labeled dextran flux from the apical to basolateral chambers. ZO-1/occludin levels were analyzed by western blot analysis. A set of experiments was performed to compare the effects of both VSL#3 on TEER values, dextran flux and ZO-1/occludin expression in CaCo-2 monolayers after heat stress exposure. Results: US- and Italy-made VSL#3 have opposing effects on TEER values, dextran flux, and ZO- 1/occludin expression, being all these parameters negatively influenced just by Italy-made product. US-made probiotic did not affect baseline TEER, dextran flux and ZO-1 expression and strongly increased occludin levels. Of note, pre-treatment of monolayer with US-made VSL#3, but not Italy-made product, totally prevented the heat-induced epithelial barrier integrity loss. Conclusion: Our data trigger the need for reassessing efficacy or safety of the Italy-made VSL#3 considering intestinal epithelial barrier plays an important role in maintaining host health. Keywords: VSL#3, probiotics, epithelial barrier, heat stress, trans-epithelial electrical resistance, dextran flux, zonulin-1, occludin. Keywords:VSL#3, probiotics, epithelial barrier, heat stress, trans-epithelial electrical resistance, dextran flux, zonulin-1, occludin. Abstract:Background: VSL#3 has been extensively investigated and is currently recommended for the prevention and treatment of chronic pouchitis and ulcerative colitis. 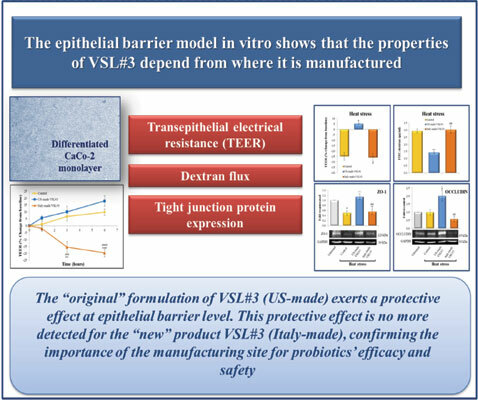 Nonetheless, in vitro and in vivo studies have recently shown variability in the VSL#3 efficacy often attributed to the manufacturing process.